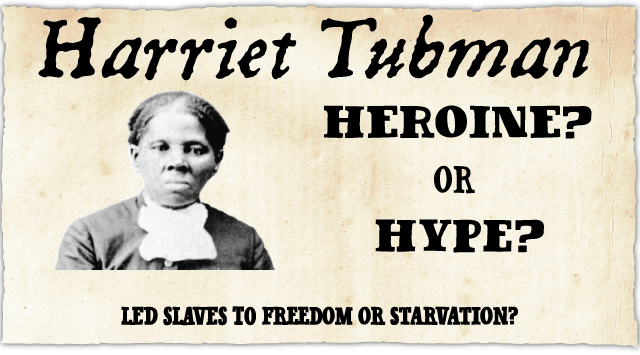 Harriet Tubman: Heroine or Hype? Evidence of starvation back in the1860's can be seen after the Civil War when hundreds of thousands of slaves (perhaps a million) died of starvation after they left the plantations and ran out of food. Hence, wouldn't Harriet Tubman, the abolitionist, only cause those slaves she helped escape, to starve to death or die of Disease. How ironic! And now people want her image on currency when she actually is responsible for perhaps a dozen (or thousands) of deaths from starvation? Note, so far, there apparently are no slave names, places or locations to the 13 or 19 missions that Tubman supposed went on. Just historian summary opinion and commentary. History books say that Tubman needed to use a gun to keep the runaway slaves from turning back to avoid starvation. Yet, how can she be starving to death and still have the strength to run while also pointing the gun at the runaway slave throughout the escape? This seems suspicious, and it gets more suspicious as we read this happened on her many missions. Furthermore, we also read how on Tubman's personal escape, she (Tubman herself), almost starved to death several times. While being shelters, supplied, fed and funded by a underground railroad where she was the most famous conductor of this underground railroad, why were she and her slaves still starving to death on her many missions? If there was any underground railroad, you would think this "underground railroad" would have solved the "starvation" problem by now, or at least by Tubman's 2nd or 3rd mission. That would be very poor planning by Tubman and the Underground Railroad. If Tubman, with over 13 to 19 missions, freed like 70 slaves, that would be like 4 to 6 slaves per mission. That means food and water for around 5 slaves plus Tubman. That's a lot of food and water to carry and plan for. Yet, if Harriet Tubman was this famous conductor of the Underground Railroad, and she had all these sympathizers, why did she need a gun to force these runaway slaves from not turning back to avoid constant starvation along this journey? You think on the 2nd trip, as a conductor, you have all these hiding and drop points worked out, otherwise, Tubman and all the slaves with her would have died of thirst, starvation and/or exhaustion. If the Underground Railroad actually moved 100,000 runaway slaves and Tubman needed a gun to keep the starving slaves moving, why do you not read much in history about escapees that ended up in starvation and dying of dehydration? Moreover, did all the other conductors of the Underground Railroad also need guns to keep their slaves moving? Furthermore, if 25% of the freed slaves are the Civil War starved to death because of no jobs and food after the Civil War, what did the Underground Railroad's 100,000 slaves do after escaping? Did they have the skills to work in the North? Were the jobs waiting for them with their type of skills? Lastly, if Harriet Tubman Runaway Slaves wanted to turn back and be a slave to avoid starving, why shouldn't the first African Slaves (even before 1776) also be free and willing Africans (slaves) and get on ships to also avoid starving to death? "She always made her rescue attempts in winter but avoided actually going into plantations. Instead, she waited for escaping slaves (to whom she had sent messages) to meet her eight or ten miles away." In regard to escape planning, it has been said that slaves would meet 8 to 10 miles away on 1st rendezvous? Hence, slaves were escaping from plantations and hoping to meet up with Tubman somewhere they didn't know? Addendum: There is talk of replacing Andrew Jackson on $20 with Tubman because of all those slaves Tubman freed. However, it is likely that at least 25% of them freed by Tubman died of starvation after the Civil War just like all the other 25% of the Slaves who left the Plantation and died of starvation after the Civil War. If Harriet Tubman said she never lost a passenger but that most conductors did lose at least one or many more passenger, what did she do different that the other conductors didn't do? In regards to Harriet Tubman successes in the Combahee Raid, the raid only yielded 100 soldiers at best out of 700 slaves. And of those 100 or so new soldiers, most didn't read or write. Moreover, the Union Army now had to find shelter, food, water, and transportation for 600 slaves, which was very difficult back then as food was in scarce supply. Next, of those 100 freed slave young males, they were probably the most productive farm labor hands that were also needed to feed these same 700 freed slaves. Hence, now, you take away those 100 and the remaining 600 will now have an even harder time of feeding and supporting themselves. Basically, a self-inflicted double whammy. In other words, the Combahee Raid was a total Fiasco. Some have asked why didn't the Slaves leave the plantation during the Civil War and why the Confederacy had forbidden the Slaves from fighting with the Confederacy. Well, the reason is that "someone" has to stay on the plantation to work the farm and feed everyone including women, children and the elderly. So what is Harriet Tubman's achievement on the Combahee River except but more mouths to feed for the Union Army....and lots of military propaganda and hype? If slaves were actually in iron chains and collars, how in the world could the Underground Railroad free 100,000 slaves? In other words, how can a slave be in chains and a collar, then free themselves Saturday Night, but then not be noticed missing until Monday? That means slaves had a lot of freedom on the plantation and were not in chains and collars. Likewise, if no chains were needed on the plantations, why the need for iron chains on ships? And why the need to make a capture in Africa? Aside, if New Orleans was the Slave Trading capital of America and slaves were treated like animals, where were are all of the iron chains and iron collars that kept the tens of thousands of slaves from escaping? That is, shouldn't there be thousands and thousands of historical chains and collars all over New Orleans, on the ships and in the South? In other words, African Slaves were much like today's Cubans, Mexicans, and Latin Americans who *willingly* left their homeland to escape constant border war, disease, drought, extreme poverty, and starvation. The fact that Harriet Tubman stated she almost starved to death on her many rescue missions shows that chains and collars are just silly Hollywood hype as back then, they didn't have convenience stores, zip lock bags, Food Stamps, or even Electricity. Aside, the movie Roots has been described as "faction" (i.e. fact plus a few lies and fabrications). Put antoher way, in the real world, Africans were not hunted down (or captured) but were doing the exact opposite, and doing everything they could to get on those Slave Trading ships to escape constant war, drought, disease, and starvation. Big Question on Video below. How far can Slave Women run with cages of live chickens and a goat in their arms? Lookin at this video below you may be reminded of Hollywood sensationlism. If you think about the above video, you might ask that if you burn down a plantation. you better have a lot and lots of food or some place that produces lots of food. That is, you burn down a plantation, you had better have another plantation close by, or another farm as there were no WalMarts of advanced farming methods back then much less EBT or Food Stamps. This, not to mention the ability to preserve and store food was very limited back in the Civil War era, e.g. no electricity, refrigerators, Tupper ware, zip lock bags, etc. According to history, Harriet Tubman basically freed only her relatives on her missions. That means she could not convince any of the non-relative slaves. That's something right there that History hasn't talked about as it seems odd that Tubman could only free her relatives and couldn't convince any slave who was not also her relatives. Furthermore, how was Harriet Tubman able to know the location to all her relatives on all these different plantations when the so-called evil Slave Masters and White men "separated" slave families? Back then, the only communication was by physical mail delivered by horseback. (And who is writing to who?) There must have been a lot of communications between the plantations in all these different states and communication by slaves, who could not read or write. If Tubman went back only for her relatives and could only convince relatives, how could the other Underground Railroad conductors free slaves that were not their relatives? Or could these other conductions only free their relatives as well? If there 100,000 freed slaves by the Underground Railroad, then that means that you would have had to have 1,500 other Harriet Tubman-like conductors each freeing 70 slaves on like 13 trips? That's a lot of Harriet Tubmans-like conductors. Yet if the other Underground Railroad conductor only did half of what Tubman did, then that would be the equivalent of like 3,000 Harriet Tubmans like conductors. Lastly, all of these other conductors would only free their relatives and would have to have known all of their relatives locations. Hence, how could all these conductors know the locations to all their relatives if the Slavery actually separated families? It's not like they have Facebook back then. In summary, if Slavery actually separated families, how could the Underground Railroad, and all of its conductors, know the locations to all of their relatives? There are some who think the strong young slaves were separated from their families and sold to the highest bidder. However, "farming" is a lot of teamwork. Hence, those children, elderly and women do the many other tasks needed for farming and making a plantation work besides plowing the field. From sewing, weaving, feeding livestock, preparing food, washing clothes, and getting water is what is needed from elderly slaves, young children, and women. How and why should any of these slaves trust Tubman to begin with? First, these slaves (relatives or not) probably have never seen her, and have never spoken to her. Yet traveled 8 to 10 miles away with full trust in such a dangerous journey that they won't starve to death or get lost with essentially a total stranger? This, plus complete abandonment of their family and friends on the plantation on which they depended upon each other in harvesting crops that feed all of them as they did not have Welfare or Food Stamps back then. The sheer fact that only 1 in 3,165 slaves were runaways shows that the Underground Railroad was mainly hype as it was the very rare occurrence to have a runaway slave, and likewise, the Underground Railroad was mainly journalistic hype. The Hyping of Harriet Tubman appears to be like the Hyping of Private Jessica Lynch during the 2003 Iraq War. However, Lynch admits all that hero hype was false. On the other hand, the Hyping of Tubman appears to grow and grow over time.